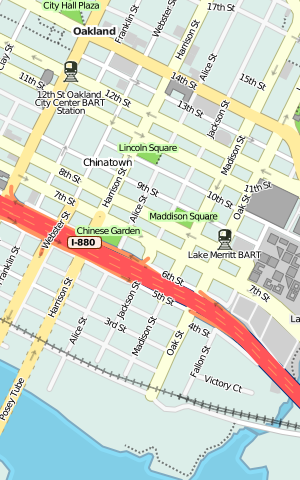 I'm continuing my months-long meditation on city cartography with a jump into OpenStreetMap, the "editable map of the whole world ... being built largely from scratch ... released with an open content license." A few weeks back, I released Cascadenik, an application of cascading stylesheets to the Mapnik rendering library. 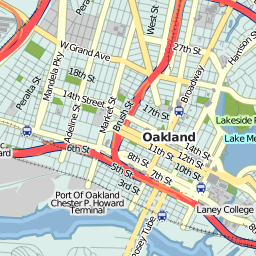 The rationale for writing it in the first place was to replace the base map we're using for Oakland Crimespotting. I love the look of Microsoft's VEarth cartography, but it's missing data crucial to an understanding of urban crime: parks, schools, businesses, and transit. OpenStreetMap is the only free-as-in-speech way to create a beautiful, useful, and complete city map that can incorporate such ground truths. The NavTeqs and Teleatlases of the world where the online mapping services get their data are primarily interested in and funded by navigation, so it's not going to be in their interest to go neighborhood-deep to track locations of playgrounds or liquor licenses. I'm trying to foreground modes of public transportation, especially rail. BART plays such a huge role in the Bay Area, and an understanding of where stations lie in relation to homes and businesses is crucial to understanding the local streetscape. For an historical view of this, check out my old flea market mapping experiment, and pay attention to the difference in appearance between the 1912 map, made to show rail coverage, and the 1936 map, made by Shell Oil to hide it. Taking a cue from the 1936 map and VEarth's road rendering, there's a much sharper distinction between major and minor roads, with minor roads dropping back to form a spidery matrix of connectivity between major roads and transit stops. This seems to help with the legibility of parks and other features at zoomed-out views, showing how they anchor neighborhoods and provide textural variety. It also makes room for labels on schools & parks that would otherwise be crowded out by street names. A lot of excess detail is being intentionally omitted. Parking lots and ATMs exist in the standard OpenStreetMap tileset, but I'm leaving those out here because I don't feel that they're helpful. I'm also omitting underground rail, it's just not relevant to surface use. 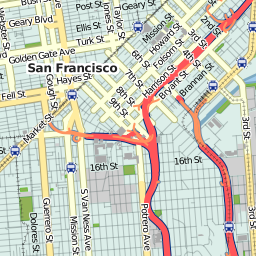 The color of freeways is red, a fairly standard decision seen on most U.S. maps. 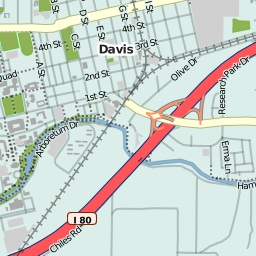 Major roads are all fairly pale, with small variations in color around yellow and orange to make them visible but less overpowering than the blues and reds used by OpenStreetMap's own tiles. Working with Potlatch, the Flash-based OSM editor, has been interesting. 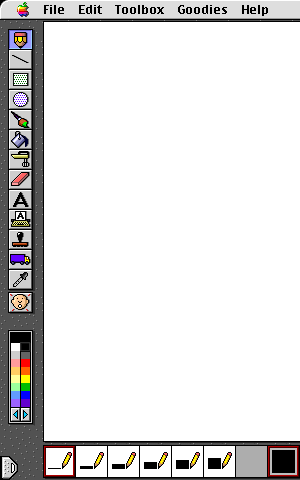 Although it does the job exceedingly well, I'd welcome an editing interface derived more from KidPix and SimCity than AutoCAD or ArcGIS. My dream is a UI that dispenses with tagging in favor of tools like "road", "school", "park", or "bulldozer". 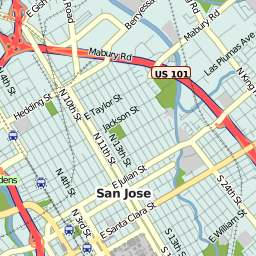 The new tiles are being updated from fresh OSM data on an almost-daily basis, and hosting on S3 means you can hit it pretty much all you want for your nine-county Bay Area mapping needs. Now, to get all these schools included.